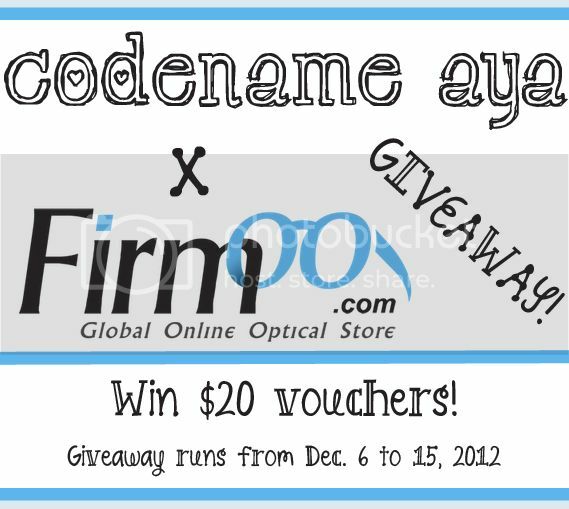 Few more weeks before the holidays and top online optical store, Firmoo.com, is generous enough to give away $20 vouchers to 20 readers of this blog! Just in time for my blog's second blog anniversary, too! Brand description (from Firmoo's website): Firmoo.com is the world's most popular online optical store. Years of expertise in optical industry enable Firmoo.com to offer varieties of prescription eyewear to the consuming public in high quality yet at extremely affordable prices. Firmoo provides a large quantity of high-quality and fashionable eyewear at the most affordable prices. With years of experience, Firmoo has gained a solid reputation and trust within 470,000 fans on Facebook. First thing I noticed when I first browsed Firmoo's site is their wide range of prescription glasses. There's some for men, for women, there are different frames and materials that you can choose from. As for the price, their glasses are priced at $8 to $50, depending on the design and the material used. They also have a Free-for-New-Buyers offer which allows first-time buyers to get their glasses for free. Nice, right? Like Firmoo Online Optical Store on Facebook. This giveaway is open internationally. Again, I believe, though, that this giveaway will be of greater benefit to US-based readers or to those with US addresses because of the less expensive shipping fee. This giveaway runs for 10 days (Dec 6-15, 2012). The prizes are sponsored by Firmoo.com. 20 winners will be selected randomly. I might decide to pick more. Each one will be notified and sent a $20 voucher code via email. The $20 voucher codes are valid until Dec 25, 2012 and can only be used once. I will get this #KLD8054 I love this! That's true. Ka-turn-off ang SF! :( But if you have relatives in the US who are going home for the holidays, pwede na rin because standard shipping to US addresses is only $6.95.